It has been estimated that by 2020 Millennials will make up over a third of the global workforce and over one-third the population of India will be between the ages of 15-32 years old. Fuelled by India's growing millennial population, it is not hard to predict that the country is going to get a makeover followed by the entrance of fresh and modern philosophies. Good proportions of young minds have already initiated this revolution and are breaking the shackles of age-old perceptions, especially in the field of education. Where once parents used to play a prominent role in deciding the career path of their wards, today, the students are coming forward and expressing their interests without any fear and uncertainties. The so-called "off-beat" career options offering matchless scopes are also strengthening the trust factor in the students towards following their respective passions and eventually turn them into professions. A promising career route, which possesses a high possibility of success and assures to hone one's creativity, is Animation and Design education. Hence, ditching the conventional captivation towards the more "lucrative and safer" fields such as engineering and medicine, now students are responding positively to their true callings and are enrolling in the Animation and Design colleges around the country where along with gaining the opportunity to taste success and fame, they also are introduced to a world where creative thinking is encouraged and appreciated. On one hand where, as per reports shared by Research & Markets, the Indian animation industry is expected to reach the 23 billion mark by 2021 as it is known to grow by 15 -20 percent per year, on the other hand, by 2020 the potential market for design in India is expected to be INR 188.32 billion (GBP 1.43 billion). Given this hopeful demographics, rising educational aspirations, openness to pursuing alternate careers, employment opportunities and soaring number of design aspirants, numerous Animation and Design institutes are mushrooming in every corner of the country. 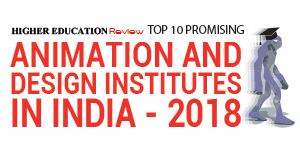 To provide the new generation a clear picture regarding a handful of esteemed animation and design institutes, which stand out genuinely in terms of quality of education and training, we at Higher Education review have come up with "Top 10 Animation and Design Institutes in India 2018". Created minutely by our team of experts and researchers, we have recognized the chosen institutes on the basis of high standards of excellence, incorporation of finest infrastructure and career placement facilities.